Slight change of subject: When I moved off campus I needed transportation, and I didn't have enough money for a 10 speed bicycle. So I bought this 305 Honda Super Hawk for 50 bucks and rebuilt it. It would run with a 450 - the fastest I ever got it to was 102, and I ran the tach out to 12,000 RPM in high gear with a somewhat reduced gear ratio I put on it. 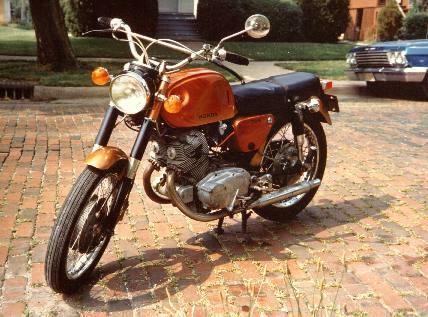 It was probably one of the least safety-conscious motorcycles ever built: no kill switch, no return cable on the throttle, unbalanced brakes, and the alternator was too weak to ride it with the headlight on. But I survived it for about five years.